Suddenly and without warning, The 9th Doctor materialises inside the Big Brother house; Rose appears on the set of The Weakest Link; and Captain Jack Harkness wakes up as the latest person to receive his 15 minutes of fame on What Not To Wear… in the future. And in the future, reality TV and gameshows have changed radically. Not only are they hosted by robot versions of the current hosts, the penalty for losing is death. In fact, in the case of What Not To Wear, the penalty for just participating is horrific mutilation and death. It’s approximately 100 years after The Doctor, Rose and (ugh) Adam arrived on Satellite 5 in (N007) The Long Game, and something has gone desperately wrong with mankind’s future yet again. It’s now up to our intrepid travellers to solve the mystery. But before that, they have to figure out how they arrived on the air. And before that, they’ll have to escape. 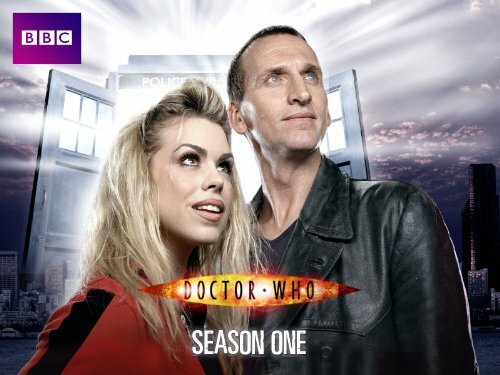 This is the first instalment of the two-part finale, not only of series 1 of the Doctor Who revival, but of Christopher Eccleston’s run as The Doctor. Stay tuned for (N013) The Parting of the Ways. The first episode of the concluding two-parter of series one of New Who is very much of its time; packed with a futuristic take on contemporary gameshows. The idea of a satellite packed with murder gameshows is, in itself, really quite creepy (though whether it makes logical sense in terms of the situation revealed at the end of the episode is another thing altogether). However, the use of incredibly recognisable reality TV and gameshow formats from The Weakest Link to Big Brother puts this episode firmly into the realm of hyperrealistic high camp – and, from the perspective of 2014, a mild nostalgia fest. The later series have sensibly kept their contemporary nods to the small in-jokes about Scottish independence in The Beast Below and Deep Breath; the gameshows, presumably intending to showcase the new show’s contemporary appeal (and distinguish it from the cardboard monsters reputation of the classic show) have sadly dated this episode badly on rewatching. The big reveal at the end of the episode also rather fails to make any sense; I at least find it hard to imagine Dalek psychology coming up with the labyrinthine process of setting up orbital studios to scoop participants into murder gameshows to cover their process of taking cells to breed a Dalek army (a small war or two seem a lot easier and less elaborate, as well as just more their kind of deal). Overall, I give this a 3.2.